In 1992, Hurricane Andrew left Florida devastated. As communities began to rebuild their homes and businesses, they faced myriad challenges and delays when filing insurance claims to receive disaster relief funds. Additionally, the lack of a uniform, statewide building code and the insufficient enforcement of building standards before the Hurricane made the reconstruction process seem insurmountable. 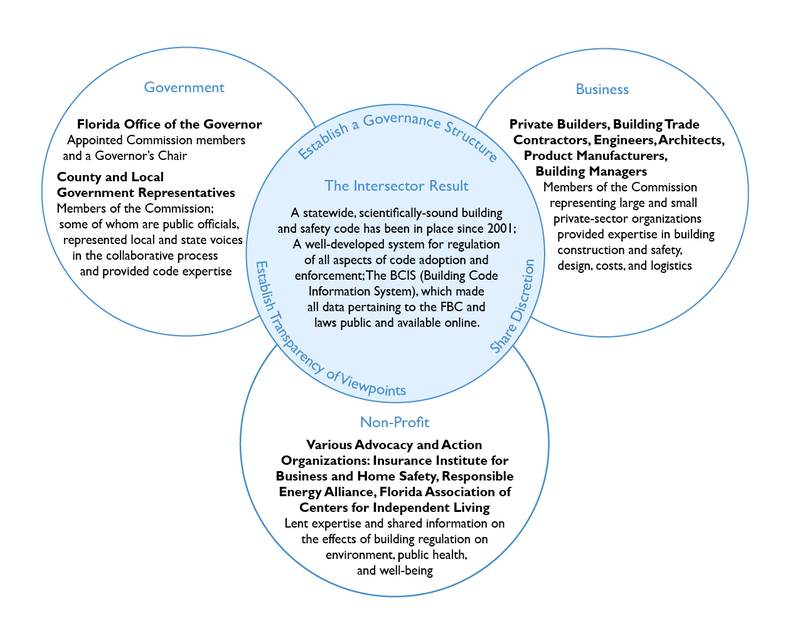 In 1998, following the recommendations of a study conducted by the Building Code Study Commission, the Florida Governor’s Office sought to institute new statewide standards for building safety and practices — both to assist in the rebuilding efforts after Hurricane Andrew and to lay the groundwork for future development and expansion. 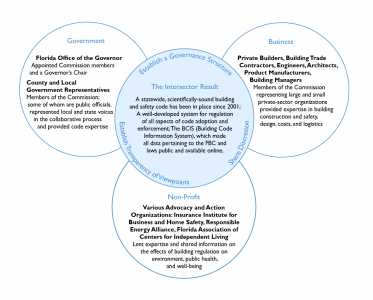 The newly created Florida Building Commission (FBC), however, was challenged by conflicting interests and unable to create a cohesive vision to implement change. After a year of struggling to build consensus, the Commission enlisted the help of experienced facilitator Jeff Blair of the FCRC Consensus Center at Florida State University. Using a variety of tools common to successful cross-sector collaboration, Jeff was able to bring together the nonprofit, public and private sectors to fulfill the Commission’s goal of creating a statewide building code. Before Jeff’s involvement, the highly partisan FBC was plagued by opposed motives and interests. As the Associate Director of the FCRC Consensus Center, he had experience in negotiation which trained him to foster joint solutions between representatives from state and local government, citizen/watchdog groups, construction businesses, design professionals and product manufacturers. Under Jeff’s steady facilitation, remarkably, the FBC achieved 100 percent consensus on nearly every vote related to the new statewide building code, despite comprising members from different sectors with widely different interests. All decisions required a 75 percent or higher threshold to pass, rather than a simple majority. In an interview with The Intersector Project, Jeff said this practice “discourage[d] the formation of small, temporary alliances of convenience to push a measure through and instead foster[ed] lasting relationships.” It is also a means by which inclusivity was reinforced. When consensus was weak, Jeff encouraged members to revisit contentious issues, address outstanding concerns and seek solutions that stakeholders could agree to support. Jeff’s work is an excellent example of establish transparency of viewpoints — the creation of an environment in which partners can communicate openly, allowing the collaboration to address partners’ differing priorities. In an open environment, partners trust each other, have equal opportunities to express their diverse opinions and perceive that they are able to raise concerns without fear of retaliation. By creating channels to hear and respond to partners’ perspectives and concerns, the collaboration acknowledges the conflicting opinions that can arise from the distinct values and goals of each partner, establishes a forum for consensus-building and nurtures understanding across organizations and sectors. Open environments are a foundation for key collaborative work, critical to nearly every aspect of collaboration design and implementation, particularly those that require partners to come to consensus concerning issues on which they are likely to have differing perspectives. Building a common fact base, agreeing on measures of success and establishing a governance structure are just a few examples. In the case of the FBC, the body ultimately was instrumental in streamlining the statewide adoption and enforcement of improved hurricane protection standards. The Governor’s appointment of an FBC chair and 25 stakeholder representatives has given further legitimacy to the organization. Private-sector members, such as insurance companies and energy groups, are encouraged to participate in deliberations and bring their particular technical knowledge to the development of working codes. Nonprofits continue to highlight the responsibility of policy makers to the public. Florida’s building codes and their enforcement are the highest-ranking among hurricane-region states, according to the Insurance Institute for Business and Home Safety. Likewise, an independent study by the University of Florida shows that homes built under the FBC code sustained less damage on average than those built before the unified code. What characterizes an environment in which partners feel they can communicate openly? How will we create this type of environment? How will we handle dominant partners or other potential disturbances to an open environment? How will we manage a situation in which one or more partners feel they are unable to communicate openly? How will we balance the desire to create an open environment with the reality that we need to make decisions and progress? Will we consider using a third-party facilitator for some or all of our meetings? How will we assess whether we have successfully developed an environment in which partners feel that they can communicate openly?